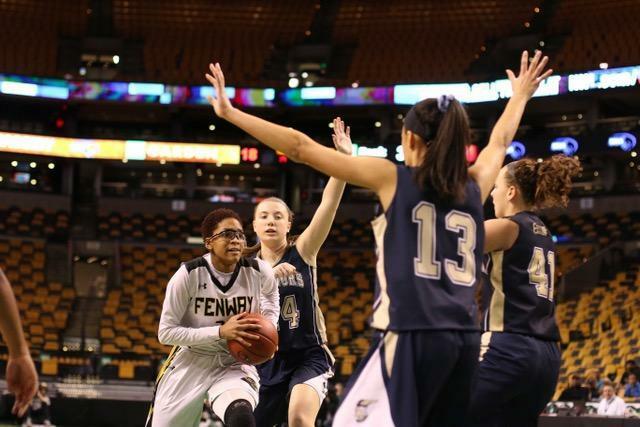 Janyah Gulley helped lead the Fenway girls’ basketball team to the Division 4 state semifinals at TD Garden last March. Ink represents an eternal spirit. A shirt brings her closer. The orange ball put her on this path. Fenway junior Janyah Gulley is determined to play Division 1 college basketball on scholarship. It was a goal set with the help of her mother, Chequetta Gulley, but now the 17-year-old is trying to reach her dreams minus her biggest supporter. Chequetta Gulley passed suddenly on Oct. 20, 2017 at 41 due to complications from a severe asthma attack. Through the pain and grieving of the loss of her mother, Janyah Gulley maintains the same aspirations, to be a college scholarship athlete. “It would be like a trophy I can give to my mom, that everything, all the sacrifices, all the getting on me didn’t go to waste,” she said. Gulley wears two tattoos in memory her mother. One on her left forearm with Chequetta’s nickname “Birdie” with her mother’s birthdate and rest date. Birds encircling her mother’s name represent her father, John, and the four children: Janyah has a twin sister, Jaylah, and two older brothers. She’s quick to say she’s the youngest, by six minutes. Her right forearm is adorned with “Birdie,” surrounded by birds representing each of the family members atop a stairway to heaven. The ink is a physical complement to her belief in her mother’s eternal presence. Chequetta Gulley went to every one of her daughter’s games, as well as an occasional practice, sharing love not only for her daughter, but her daughter’s teammates and coaches as well. Fenway coach John Rice said Gulley sometimes needs extra space. The 6-foot junior wears a custom “Gulley Team” shirt during warm-ups and on the bench. A brand inspired her mother through the siblings, the birds on both sides of the shirt represent Chequetta and the path she and John Gulley III set for their children. “It reminds me of who I’m doing this for and why I’m doing it,” she said. “There’s people that are out there that support me. Gulley’s teammate, senior point guard Colby Upchurch, lost her father her sophomore year. That ultimately led to a transfer to the Boston Day and Evening Academy (BDEA) while continuing to play basketball at Fenway. The first time she suited up for the Panthers without her mother in the stands was unfamiliar territory, yet Gulley turned a somber moment into a motivational tactic. “I was expecting to see her and hear her before and after the game, but I had a reminder, like one of my cousins said, ‘she’s here in spirit and just play your game. Once you play your game, you’re going to hear her and might take a glimpse at her in the stands,’” Gulley said. Rice, understandably, questioned whether Gulley would play last season. Instead, she flourished, helping power the Panthers to a 21-3 season and the Division 4 state semifinals against Coyle & Cassidy. Gulley said she nearly lost faith in the game, but then found solace in it. This year, Gulley and Upchurch hope to lead Fenway, ranked 20th in this week’s Globe Top 20, to the Garden again. The Panthers, idle since Dec. 21, are back on the court Sunday against Brookline. Gulley and Upchurch have been brought together through tough situations, but out of it, the duo has formed a distinct bond. ■ Wachusett Regional, which advanced to the D1 state semifinals last March, knocked off defending state champion Braintree, 56-49, on Saturday afternoon. The Mountaineers connected on three treys in the first quarter to put the top-ranked Wamps (4-1) in an early hole and led by as many as 19 points in the third quarter. “We need to improve in every aspect of our defensive game, but especially our help and recover stunting defense so we can get out and pressure good shooters,” said Braintree coach Kristen McDonnell . McDonnell acknowledged that the defeat may be just what her squad needed. “I absolutely hate losing but I do think a loss can potentially be a good thing if your team responds well and we grow from it,” said the coach. ■ With a 55-29 victory over Pembroke in the championship game of the Abington Holiday Tournament championship Saturday evening, second-ranked Bridgewater-Raynham (6-0) ran its regular-season winning streak to 20 — and have not lost a non-tournament game in a calendar year. Shay Bollin , a 6-foot-2 freshman with the versatility to play any spot on the court, and sophomore guard Kenzie Matulonis , have fueled the early success. ■ Fifth-ranked Belmont (6-0) cruised through its first six opponents with an average margin of 32 points per game. The latest victory was a 59-32 over Newton North in the Newton Holiday Classic. ■ Lowell (2-5) overcame a 12-point fourth-quarter deficit on Saturday to defeat Nauset, 56-51, last year’s Division 2 South finalist. Red Raider senior Nikki Yrrizarry scored 5 points in the final minute. ■ Veronica Burton, the Globe’s 2017-18 Division 1 Player of the Year, delivered a career-high seven assists, along with five rebounds, for Northwestern in a 68-45 win over Illinois on Sunday. In eight starts, she is averaging 7.9 points per game for the 8-5 Wildcats. ■ Former Greater New Bedford standout Nakira Examond became UMass Dartmouth’s all-time leading scorer with her 1,392th point Monday. Friday, Reading at Belmont, 5:15 p.m. — The Rockets (5-1) take their crack at freshman standout Nina Minicozzi and the fifth-ranked Marauders (6-0). Friday, Bishop Feehan at Coyle & Cassidy, 7 p.m. – The 13th-ranked Shamrocks (4-2) visit Sam Hourihan and the fourth-ranked Warriors (7-0) for an Eastern Athletic Conference tilt. Friday, Masconomet at Pentucket, 6:30 p.m. — This is the first meeting between the Cape Ann rivals since last February, when a showdown of two once-beaten teams fizzled after Masco fielded a junior varsity-only unit for one game for disciplinary reasons. Tuesday, Bridgewater-Raynham at Coyle & Cassidy, 6:30 p.m. – For the second-ranked Trojans to extend their year-plus regular-season winning streak, they have to take down the defending D4 state champion. Tuesday, Oliver Ames at Foxborough, 6:30 p.m. – An key early season Hockomock League tilt as the 11th-ranked Warriors (4-0) host the Tigers (4-1) in a Kelley-Rex/Davenport crossover. Correspondent Nate Rollins also contributed to this story. Greg Levinsky can be reached at greg.levinsky@globe.com.